Tuscany Travel Guide | Pieve di Santa Maria a Pacina | Podere Santa Pia, Holiday house in the south of Tuscany. Pieve a Pacina near Castelnuovo Berardenga, with its unusual cylindrical bell tower. 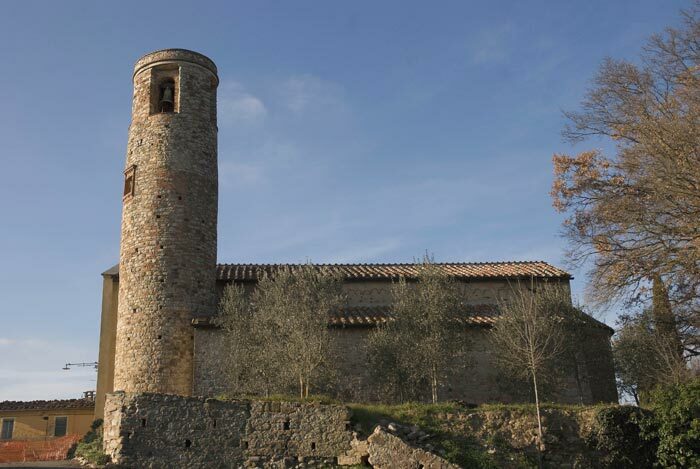 The Parish church of Pacina with its round bell tower can be found just a few kilometres outside Castelnuovo Berardenga on the road that leads to Pianella. The Romanesque Pieve di Santa Maria a Pacina is probably the same church that was dedicated to Santa Maria and mentioned for the first time in a document of 650 regarding the dispute over the possession of some parishes between the bishoprics of Sienna and Arezzo. This dispute lasted for centuries. Until 1267, the Pieve a Pacina belonged to the monks of San Salvatore della Berardenga, who had received it as a donation from the descendents of the Counts Winigi. By the end of the same century the church was at the head of a large parish that numbered as many as sixteen secondary churches. Built in early Romanesque style, it was later considerably altered architecturally, when the size and appearance of the original structure of the building were modified. It possesses a particularly interesting cyclindrical bell tower, which is the part that has best preserved its original aspect. Its ancient origins can be sensed from some of the architectural elements that are still visible today; like the surface of the exterior walls (along the whole of the left side and parts of other areas) which are particularly irregular because they were built with fragments from a variety of materials (broken bricks mixed with split stones). The doorposts at the sides of the doorway (now walled up) that we can see on the lefthand side almost certainly date back to the period in which the walls were built. The central nave is decorated on either side on a theme of groups of three hanging arches. These elements all show that the architecture of the parish church of Pacina was closely related to the Romanesque Lombard architecture of the early 11th century. The almost square plan of the basilical church is yet another example of its extremely ancient origins, while the bell tower, which once stood opposite and set aside from the facade and was incorporated later into the building, still recalls the early Romanesque architecture of Arezzo. As we said before, it has undergone many alterations over the centuries. The anterior part of the church was lengthened, so as to incorporate the bell tower and create an area to be used as a canon's house between the 17th and 18th centuries. The vaults above the side aisles were modified in the 19 C, together with the facade and the belltower. The single-light pointed arch windows that appear on the facade and the sides of the lateral naves apparently date from the end of the 19th and early 20th century. During this century the facade was refaced in brick (1920's), the battlements around the belltower demolished (a later addition that did not exist in the original construction) in 1976 and the roof restored (1984), while the facade was plastered recently. The parish church of Pacina can be found just a few kilometres outside Castelnuovo Berardenga on the road that leads to Pianella.